This unique feature provides more precise and reliable results and supplies plausibility testing for experiments at any time. There is no more need for the chemist to care about the complexity of the so called "base-line" troubles. Calo2310 pro incorporate the SYSTAG’s automatic ‘Zero Watt’ technology. 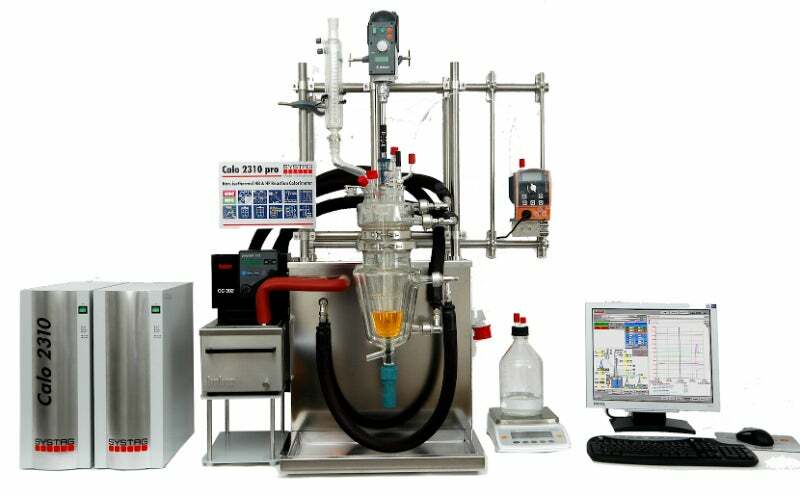 With Calo2310 pro Chemists and Process Safety representatives have now an easy-to-use reaction calorimeter for all kind of reaction and kinetic measurements. The real-non-isothermal reaction calorimeter Calo2310 pro is not anymore influenced by viscosity change, 2-phase reaction, evaporation or inhomogeneous reactions. The advantage of the built in Heat-Balance Calorimetry eliminates all those unknown influence factors. The Calo2310 pro BS is a professional, universal, combined heat-flow and heat-balance, reaction calorimeter for non-isothermal applications.